Kim Vaughan is an active chamber musician, founder member of the Benyounes String Quartet and Artistic Director of Quercus Ensemble. She studied cello in Derry and Dublin and in 2000 was awarded the Northern Ireland Young Musician of the Year prize. She continued her studies at the Royal Northern College of Music from 2003, where her teachers included Kim Bak Dinitzen, Emma Ferrand and Gregor Horsch. In 2009 she was a recipient of the Arts Council of Northern Irelands Young Musician’s Platform, which led to concerto performances with the Ulster Orchestra and a recital at the Belfast Festival at Queens, both recorded for BBC Radio Ulster. 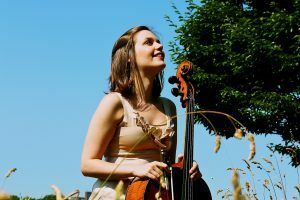 Whilst at the RNCM she was a founding member of the Benyounes String Quartet, with whom she studied at the Haute École de Musique in Geneva under Gabor Takacs-Nagy, with the support of the prestigious RPS Julius Isserlis scholarship. Here they won the conservatoire’s most esteemed Prix d’Exellence and went on to win the 2012 1st International Sandor Vegh String Quartet Competition in Budapest and second prize at the 2014 Orlando String Quartet Competition. They have given concerts to critical acclaim across the UK and Europe at venues such as, Wigmore Hall, Purcell Room, King’s Place, Vienna Konzerthaus, St Martin in the Fields, LSO St. Lukes, and the Budapest, Mondsee, Verbier, Gstaad New Year, West Cork Festival, and Aix-en-Provence Festivals. The quartet held the Richard Carne Junior Fellowship at Trinity Laban Conservatoire of Music and Dance for two years and is currently resident at Bangor University. In 2011 Kim founded Quercus Ensemble, a mixed chamber music ensemble based in Northern Ireland, which draws together fine musicians from across the UK and Ireland, delivering vibrant performances of classical chamber music and working closely with young musicians and in the wider community. She herself continues to work with young musicians in Northern Ireland in her role as Musician in Residence at the University of Ulster. Kim plays an English cello made by William Forster from ca. 1770 for which she is grateful for the support of Harriet’s Trust.